E-mail for a lot of people around the world is an integral part of their lives. Workers who rely on email probably have client software like Outlook or Thunderbird to handle their mail. There are also people who rely on Gmail because its free and reliable and because it’s from Google. Actually there are a lot of people using Gmail and they are all probably bored of the sight of their inbox. To help out with that, some people who know how to decorate their email pages with some fancy code work or hack, are decorating their Gmail accounts. However, mainstream people are doomed to look at the default Gmail design until Google changes it. Today, Change has come to Gmail! 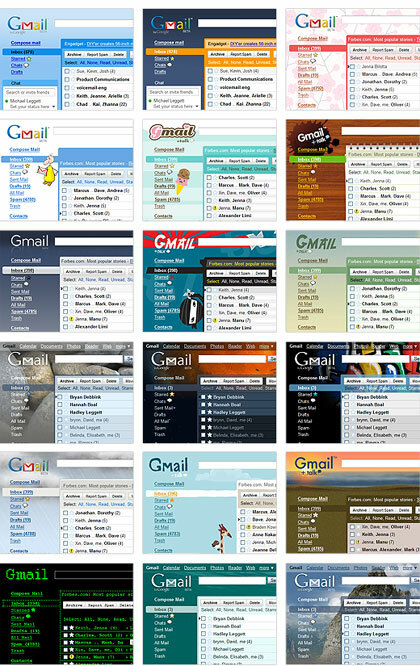 Google has now launched a couple of themes for Gmail. These themes vary from simple color schemes to outrageous graphics and fonts. "We wanted to go beyond simple color customization, so out of the 30 odd themes we’re launching today, there’s a shiny theme with chrome styling, another one that turns your inbox into a retro notepad, nature themes that change scenery over time, weather driven themes that can rain on your mailbox, and fun characters to keep you in good company. So thank you to the Gmail team for the themes. Of course we expect that more themes will become available in the future and if possible, complete customization as well.